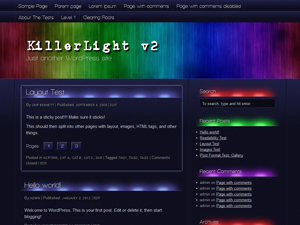 If you haven’t noticed already, I’ve made a few improvements to the KillerLight theme. I’ve taken a look at it in IE6, and it’s not as badly broken as I feared. At the moment the animated header screws things up royally, and the top horizontal navigation doesn’t display horizontally. I hope to at least get things looking reasonably presentable soon, by disabling the animated header for IE6 and changing the way the top nav is styled. As for a future release of the theme, it’s all planned out in my head. A non-branded version of the header images will be included, so anyone can have that fading animation. The name of the blog will be overlayed in standard text. I also have a few ideas for spin-off themes, which are a slightly different take (new graphics) on the same structure. Watch this space!